If you are looking for the best cooling pillow on the market, then you have come to the right page, as we have managed to find seven great ones including the best cooling pillow for night sweats and hot flashes. Cooling pillows help people sleep soundly by providing softness, comfort, and support while at the same time keeping your head free from fevers and hot sweats. Cooling pillows, or chillows as they are sometimes called, have a variety of ways of keeping you cool depending on many different factors including what the pillow is made of and how it is structured to fit your neck and head. Cooling pillows are also made of all kinds of different materials including gel, memory foam and even buckwheat. We also looked at the size, weight, density, cover material and other things that make up the perfect cooling pillow for you. While compiling this review, we spent tens of hours poring over product descriptions and manufacturer’s notes. We also browsed the reviews section of both big and small vendor websites to see what consumers were saying about chillows. We then created a comparison chart, complete with descriptions and a concise, informative buying guide to help you find the best cooling pillow for your purposes. 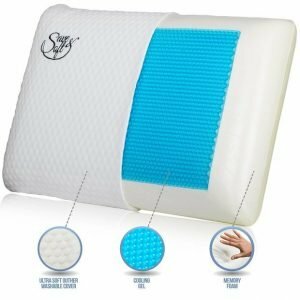 If you suffer from neck pain, then consider purchasing this chiropractic cooling pillow that is recommended by doctors for people with neck pain. This is because the pillow’s design keeps your neck’s cervical vertebrae level aligned with your spine’s vertebrae thus reducing neck pain. A bit of a slope at the base of the pillow has a couple of inches of height that cradles your head over a gentle hump, which is beneficial for both back and side sleepers. The pillow is made out of a slab of memory foam that is topped with gel inserts, which helps to keep your skin cool at night. 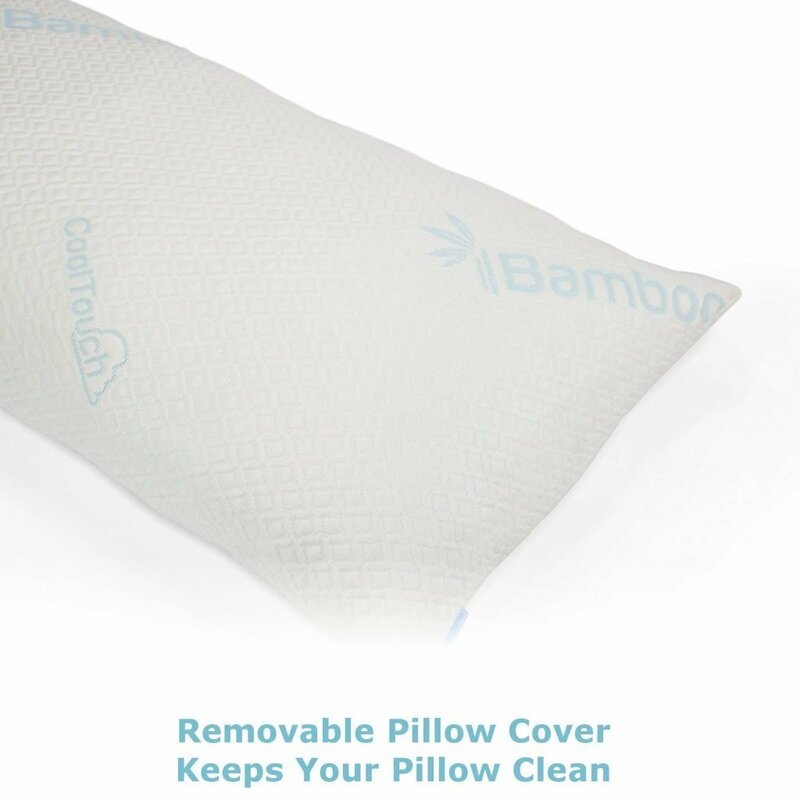 This cooling pillow is latex-free, while the bamboo cover is also infused with Aloe Vera. Therefore, this model is hypoallergenic, so it is ideal for use by people with any sort of allergies. 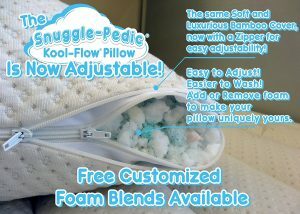 The pillow is also reversible with a cooling gel pad on one side, and memory foam on the other. Some people opt to sleep on the gel side if they are experiencing night sweats, hot flashes or fever. 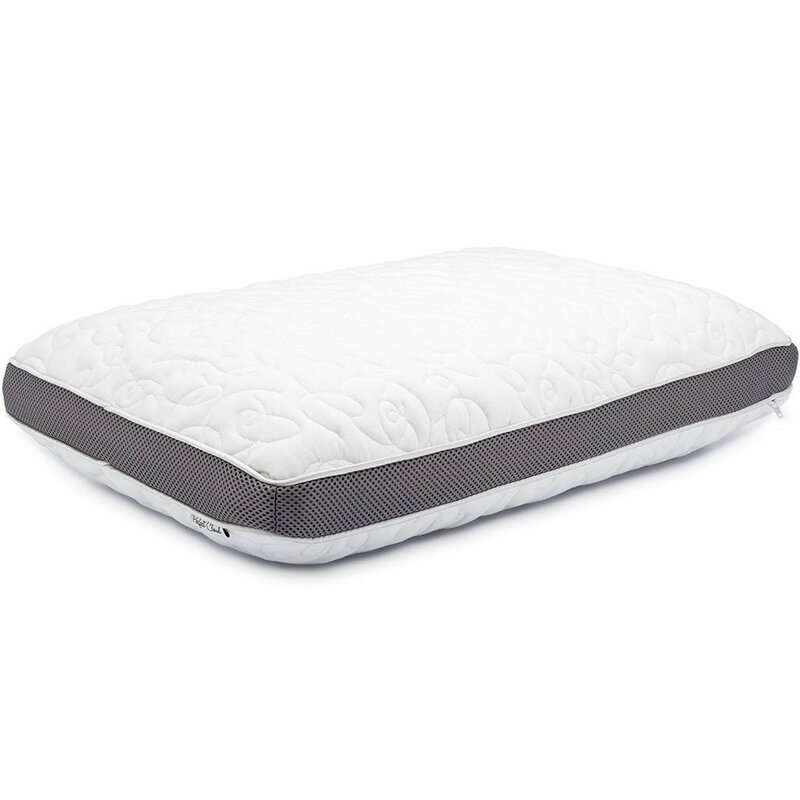 Both the foam and gel retain the shape of your head and neck, allowing you to get a perfect night’s rest. This combination of gel and memory foam pillow provides less loft and height than most chillows and cannot really be considered a plush pillow. Happy users widely report relief from neck pain, headaches as well as snoring. It also comes with a full satisfaction guarantee, so if you don’t like it for any reason, you can acquire a full refund with no questions asked. Buckwheat pillows are not a new idea, they have been used for centuries in Japan to support the head and neck and cool feverish minds. The great thing about this pillow is that you can contour it fit your head, as you like. It is called a Zen Chi pillow, because the word Zen means peace and Chi means energy, so if you use it you are guaranteed a great night’s rest. 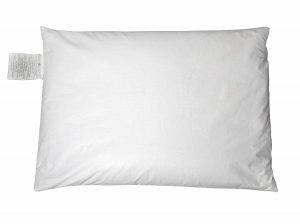 This classy, all-natural pillow features a premier cotton cover with 400 count thread, so you know that this pillow is never going rip and spill its contents, which happens to be thousands of tiny buckwheat seed hulls. For extra protection, the buckwheat hulls are also encased securely in a center case pillow insert that keeps it free from tearing, mold and bugs. Don’t be deterred by the thought of cleaning this hip, green-minded cooling pillow, as it can easily be thrown in the wash and then tumble-dried. You can also be comforted by the fact that if for any reason you are not happy with the Zen Chi pillow, that it comes with a 100% guarantee, meaning that you can return it at any time with no questions asked. This buckwheat pillow is quite big, fitting all queen-sized pillowcases at 20 by 30 inches. It is also great for people who may suffer allergic reactions from the gel or memory foam cooling pillows. This best cooling memory foam pillow is a plush model with quite a complex construction that offers sleepers a cool, airy sleeping experience. 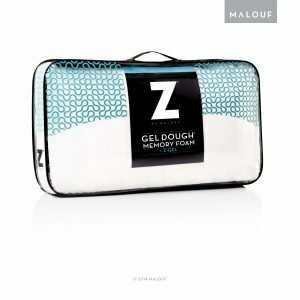 The Z in the name Malouf Z Gel Dough Memory Foam Pill stands for “zoned dough” which is a way of describing the top layer of foam, which is full of holes. These holes allow your skin to breathe. Below this top layer, there is a single layer non-ventilated memory foam that provides support. 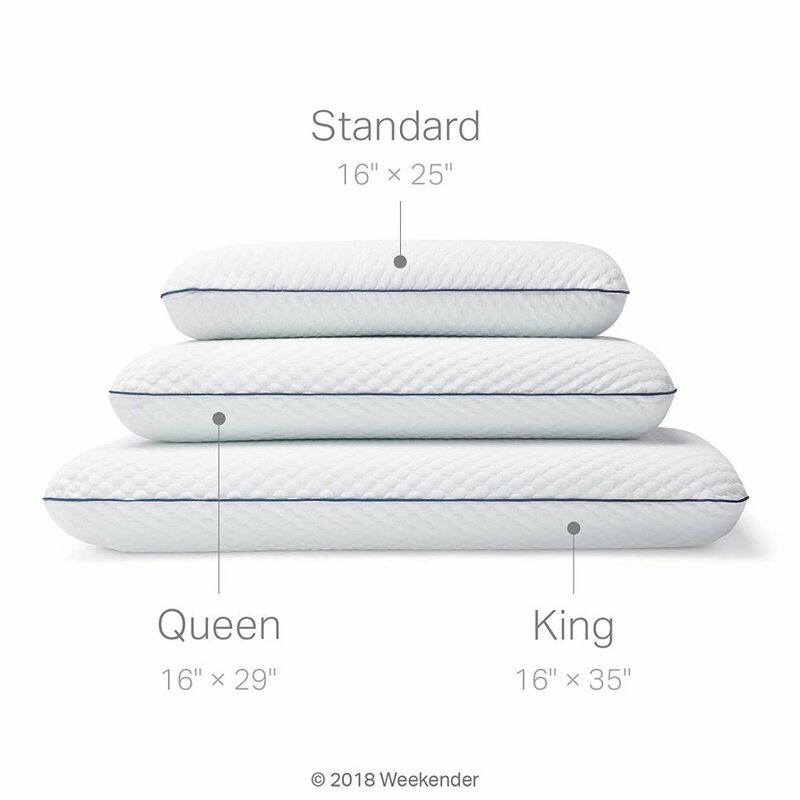 This lofty pillow comes in Standard, Queen and King sizes with the Standard being 16” by 25”, the Queen being 16” by 29” and the King being 16” by 35”. The pillow is also available in two styles: the High Loft, and the Mid Loft. 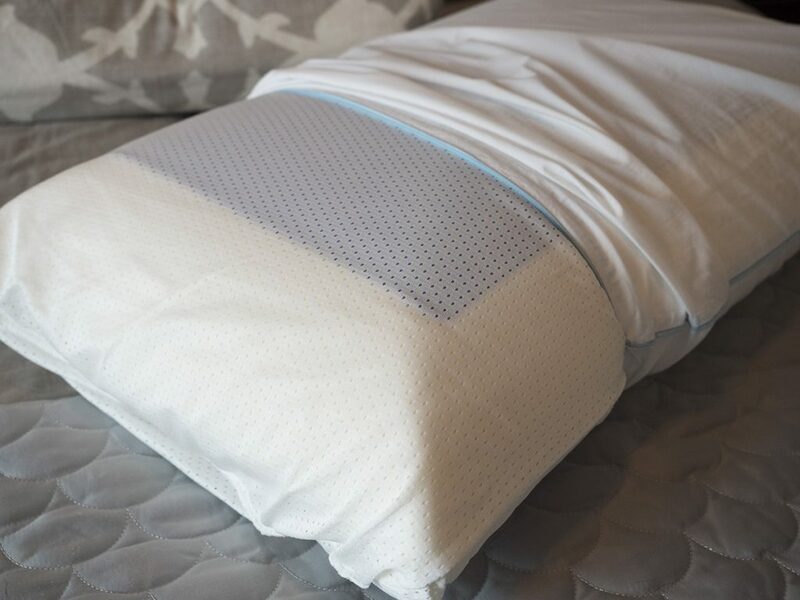 This pillow’s pin-core has received rave reviews for helping to eliminate neck and head pain, and it is highly recommended for those who like to sleep on their back. The velour slipcover is very soft and cool on the skin. If the smell of memory foam is a bit off-putting for you, keep in mind that this model does produce some, but only for a couple of days. Customers who have purchased this recommend letting the pillow off-gas for 48 hours after you unpack it. The High Loft Firm is a favorite of insomniacs, who instead of waking up several times a night, have found it helps them to sleep the entire night through. This affordable memory foam pillow is deep and soft yet firm enough to be supportive of your neck and spine. 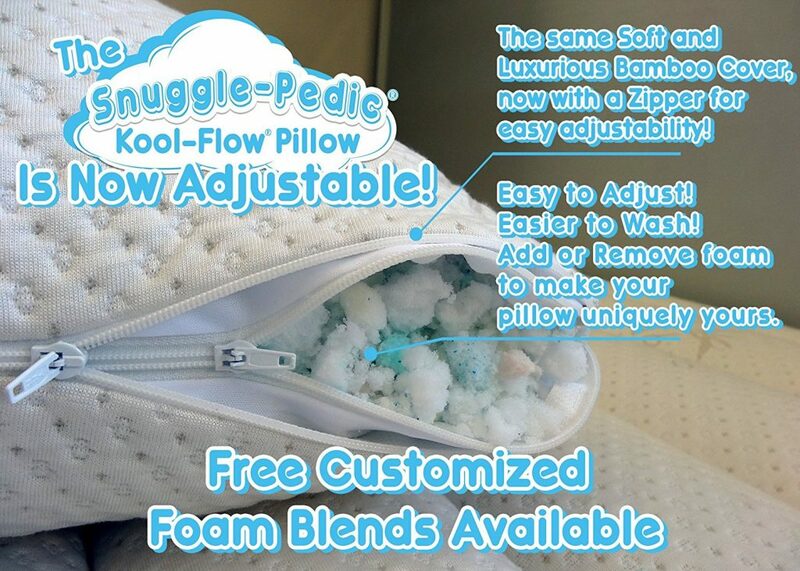 It is infused with temperature regulating gel that helps keep this pillow cool on the skin. 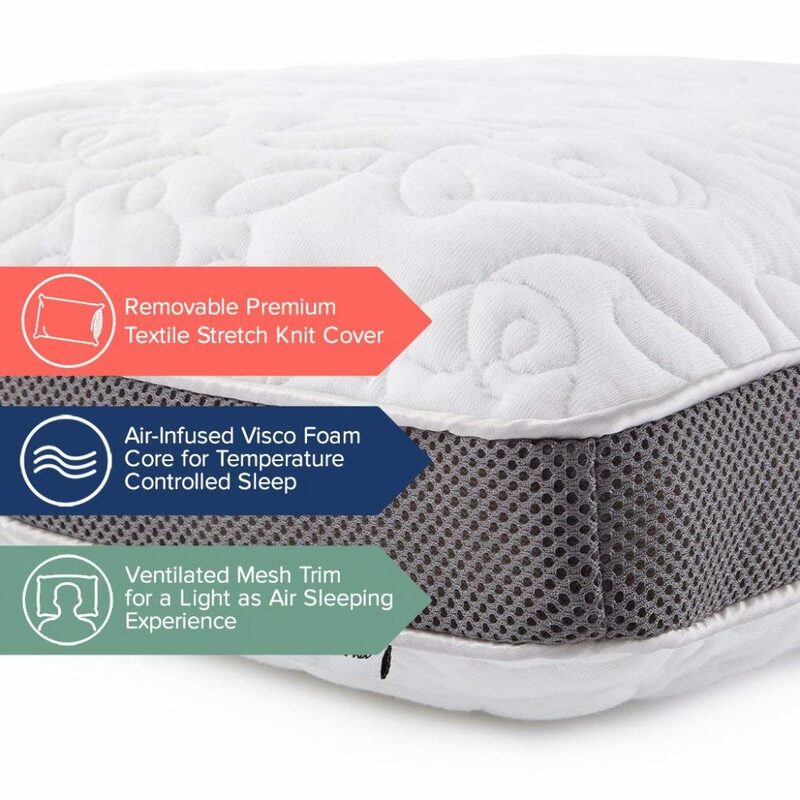 The series of holes in the foam maximize air circulation, reducing the discomfort of fevers, hot flashes and the kind of stifling humidity that is so smothering on a hot summer’s night. The cross-stitched removable cotton cover is cool to the cheek, unzips easily and is completely machine washable. 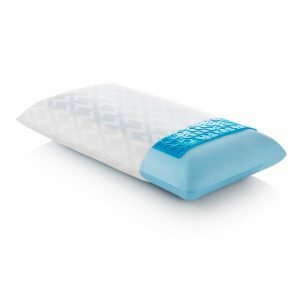 This cooling gel pillow is firmer than traditional down ones, but it still boosts your comfort with a plush feeling of its five-inch loft. It is available in three sizes, and each is ergonomically designed to prevent neck pain. It also impressed us because it comes with a three-year limited warranty. Online reviews say that this pillow is the next best thing to sleeping on a pillow filled with real feathers. The height of it also makes it great for people who sleep on their side and need just a bit of room to comfortably sleep with their neck supported on top and their shoulder slipped just below; this can help prevent the numbness and tingling in the arms and fingers that many people experience as the result of sleeping on a pillow that is too soft and too low in height. Our choice for the Best Cooling Body Pillow is the 54 x 20-inch model by Simply Slumber. It provides wonderful support for side sleepers, cradling the back without causing you to become too hot. People who sleep on their stomach and pregnant women will also love this body pillow, which is made out of memory foam chips. Nursing women also gave this chilling pillow rave reviews because it can be twisted into positions to support the feeding of the baby. The luxurious, soft pillowcase is made from bamboo fibers, with a liner of mesh to facilitate air circulation and keep your entire body cool. Bamboo fabric is also 100% allergenic, so it is good for sensitive people. This cover can simply be unzipped and thrown into the washing machine. The zipper is a high-quality YKK type that will last for many years to come. If for any reason you are unhappy with this chilling pillow you can return it as it has an impressive five-year warranty. 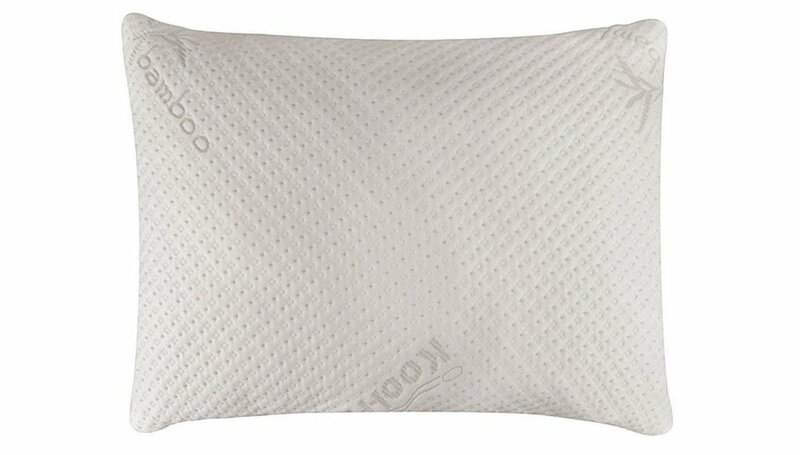 People who have reviewed this memory foam pillow have commented on how its full dimensions at 54” x 20” can relieve anxiety and loneliness, as it feels like you are sleeping with a real person. Side sleepers can place the bottom part of the pillow beneath their knees to prevent stress on the knee, and hip joints and also keep the spine straight. 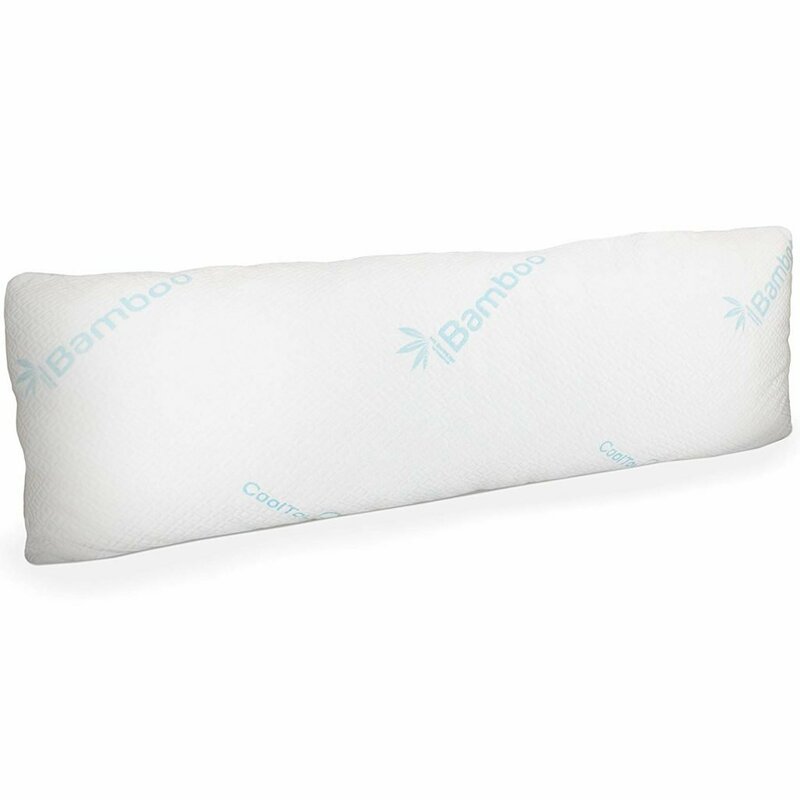 This softer luxury cooling pillow gets its snuggle factor from the fact that it is made from a combination of shredded memory foam that has a breathable micro vented bamboo, polyester and Lycra cover. The cover is vented, which allows the air to circulate around your head so that you will never be kept awake by that hot, stuffy feeling. It is the perfect choice of a chillow for women suffering from hot flashes and night sweats. 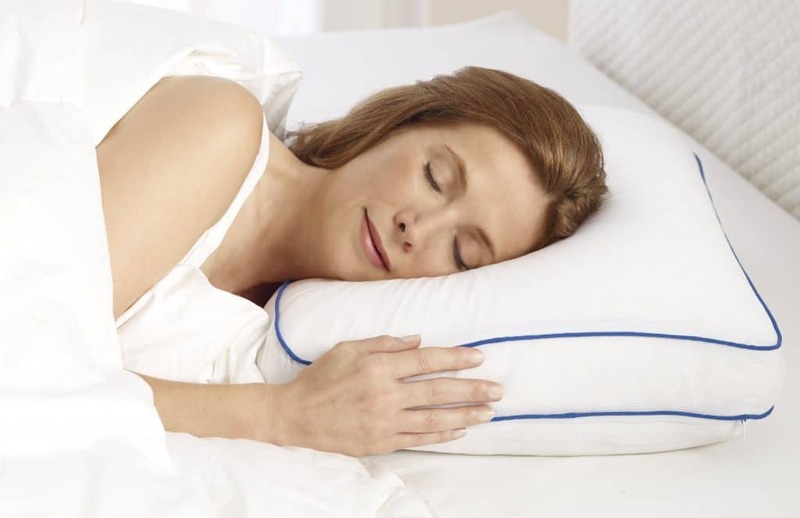 This pillow is also hypoallergenic, which makes it ideal for individuals who suffer from allergies. It is also dust mite resistant, which means, that over time, it will need less cleaning. This pillow is also considered to be a “green choice” as it is made from a combination of Biogreen and CertiPUR-US certified foam tested and shown to be made without formaldehyde, ozone depletes and PBDE flame retardants. Unlike many memory foam pillows, this one has minimal off-gassing, which means that you do not have to air it out for three or four days after you unpack it. The VOC (volatile organic compound) emissions for indoor air quality for the Snuggle-Pedic Bamboo pillow is less than 5%. 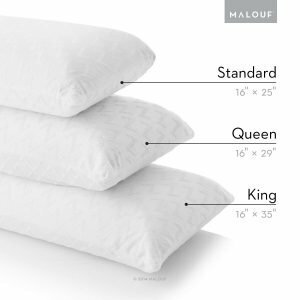 The pillow is available in three universal sizes: Standard, Queen, and King. All three sizes have a conforming orthopedic shape that nicely supports the neck. 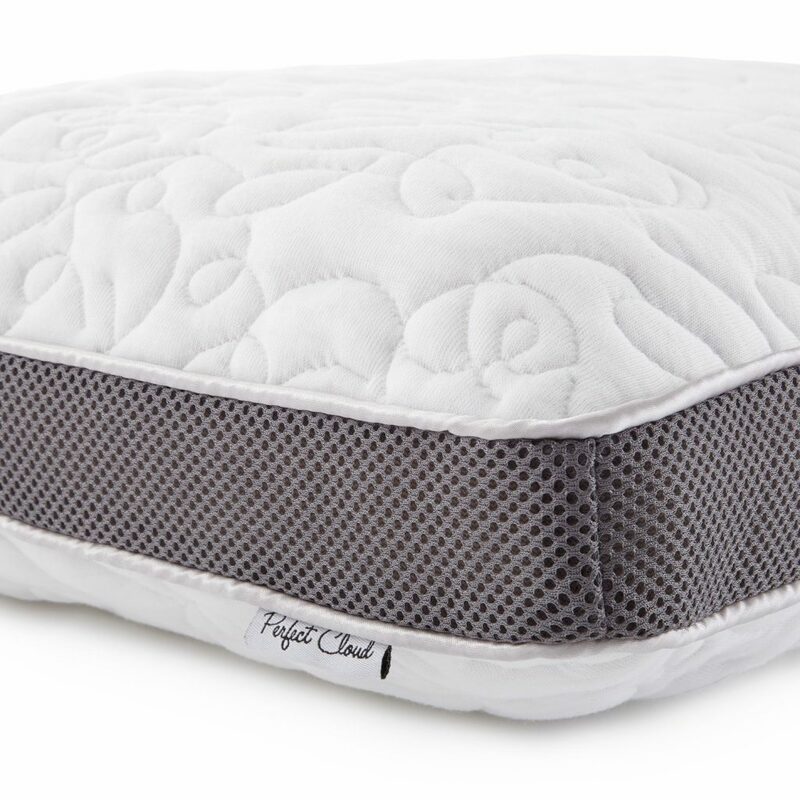 This chillow has excellent reviews from side, stomach and back sleepers alike, but if you do not like it for some reason, it has a 120-night no-hassle refund guarantee and a 20-year warranty for wear and tear. 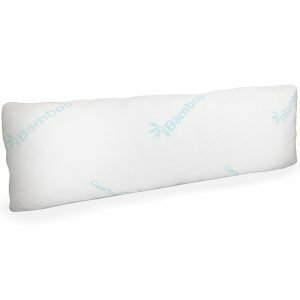 This Double Airflow Memory Foam Pillow gets his name because it is filled with ventilated visco foam with gusseted sides that allow air to flow through the sides, helping your pillow to stay cool throughout the night. The pillow has a nice five-inch lift, which gives it a bit of a soft bounce as you lie on it, so you get that feeling of sleeping on a downy pillow without getting hot or stuffy. People rave about the soft zippered cover on this pillow that is so comfortable that they don’t bother putting a pillowcase on it. The supportive foam core of the pillow allows you to easily shape it as you feel fit, so it can suit your favorite sleeping style. The air-infused central foam core keeps your skin cool throughout the night. Although the manufacturer says that this cooling pillow suits all three sleeping styles (stomach, back, and side) many reviews online say that it sinks over time, offering less comfort for those who like to sleep on their back. 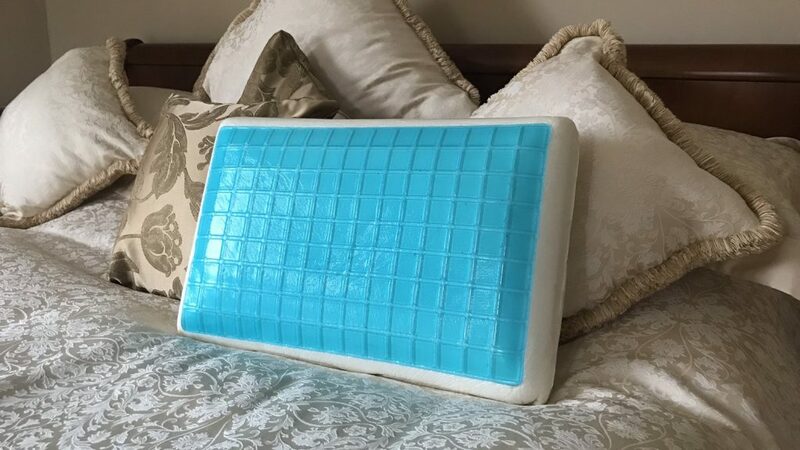 This cooling pillow is about a Queen size, and it is only available in one size. Some customers also reported a weedy odor permeating the pillow that took as long as a week. The product comes with a three-year warranty if it suffers from some wear and tear or does not give you the perfect night’s rest. 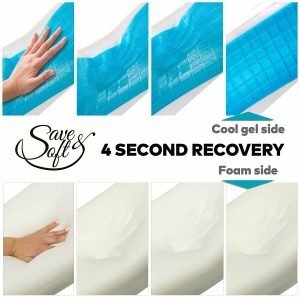 When shopping for the best cooling pillow for your purposes, there are quite a few factors that you might want to keep in mind, including your reason for wanting to purchase such a pillow in the first place. Some people simply live in a hot and humid climate and want to feel cooler when they sleep, and others suffer from medical conditions, hot flashes and night sweats that make a cooler pillow desirable. Many cooling pillows, or chillows as they are sometimes called, are also hypoallergenic, helping to reduce allergies. Many types of cooling pillows also come with chiropractic features for supporting the neck and spine, helping to relieve headaches and joint pain. What makes a pillow cooling? There are several types of cooling pillows on the market that have earned themselves the right to be called that because they have one of the following features. 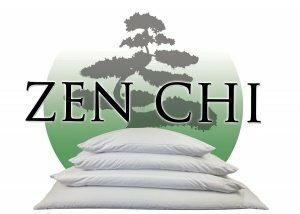 Buckwheat hulls or other natural material that allows air to circulate easily throughout the body of the pillow, as is the case with our top choice, the Zen Chi Organic Buckwheat Pillow. 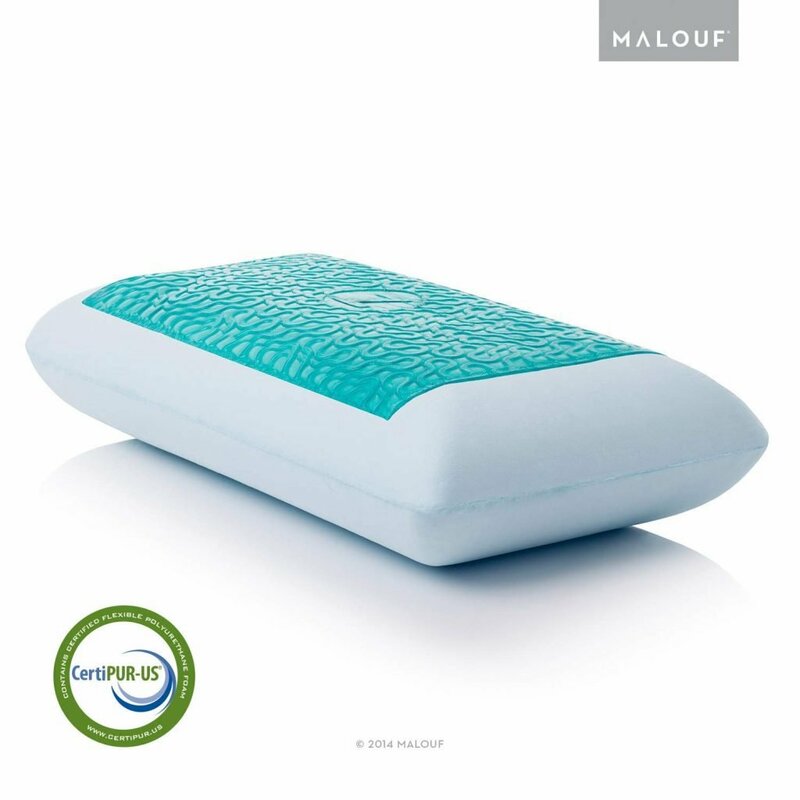 Gel-infused memory foam that is light, airy and allows air to circulate through the body of the pillow as is the case with the MALOUF Z Gel Dough Memory Foam Pillow that is also one of our top rated choices. 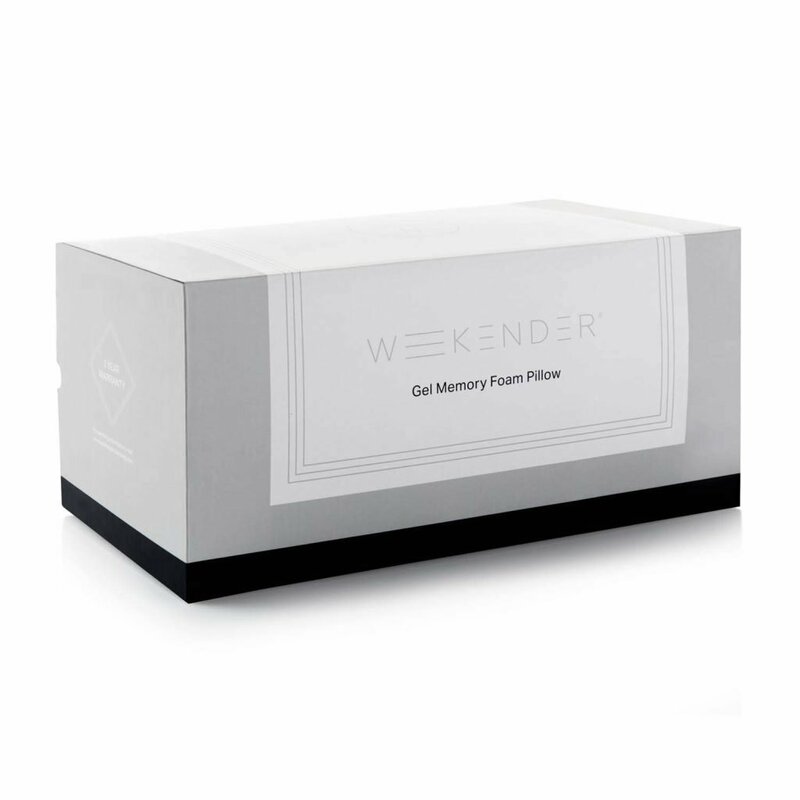 A ventilated design, where holes are actually present in the gel-infused memory foam as is the case with our Budget Pick of cooling pillow, the WEEKENDER Ventilated Gel Memory Foam Pillow. 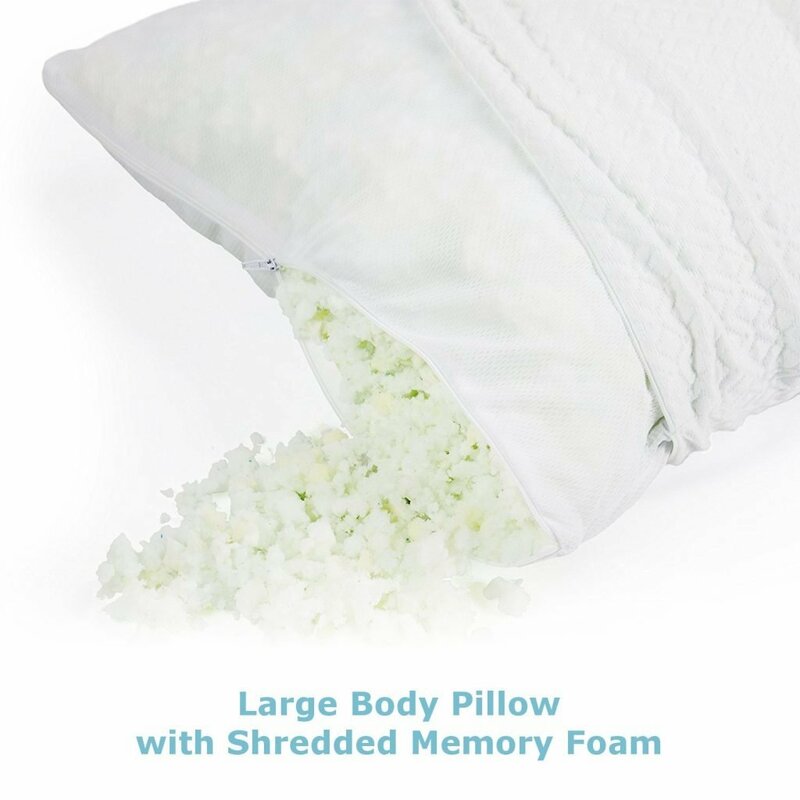 Shredded memory form filling, allowing firmness and support for the neck along with breathability as is the case with the Snuggle-Pedic Bamboo Shredded Memory Foam Pillow. Memory foam slabs accompanied by a cooling gel insert as is the case with the Save&Soft Gel Memory Foam Pillow. 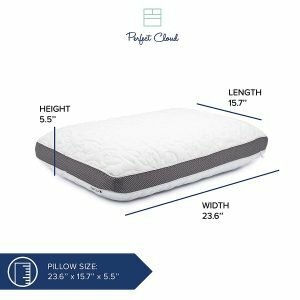 Side gussets in the pillow construction that allow air to circulate through the pillow along the sides as is the case with the Perfect Cloud Double Airflow Memory Foam Pillow. 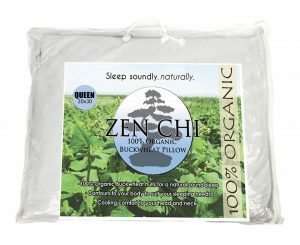 Bamboo slipcovers which are naturally cooling as is found in the Zen Chi Organic Buckwheat Pillow. Some cooling pillow types offer a combination of the above as part of their features. For instance, the Simply Slumber Memory Foam Body Pillow has both the cooling shredded memory foam and the bamboo cover to help facilitate a good night’s sleep. There are all kinds of factors that define a chillow. 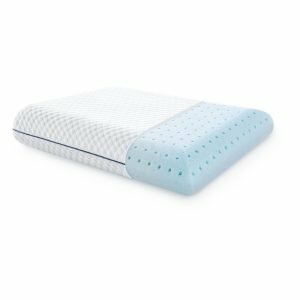 Here are the features that you should take into consideration before choosing the cooling pillow that is going to work best for you. Before buying a chilling pillow you might want to consider what is inside of it, as filling materials definitely vary from brand to brand. Here is a look at some of the commonly used filling materials in chillows. Shredded memory foam, as if found in the Simply Slumber Memory Form Body PIllow is the cheapest and most popular filling, with the ventilation being the result of not sleeping on one hot, single slab of memory foam. 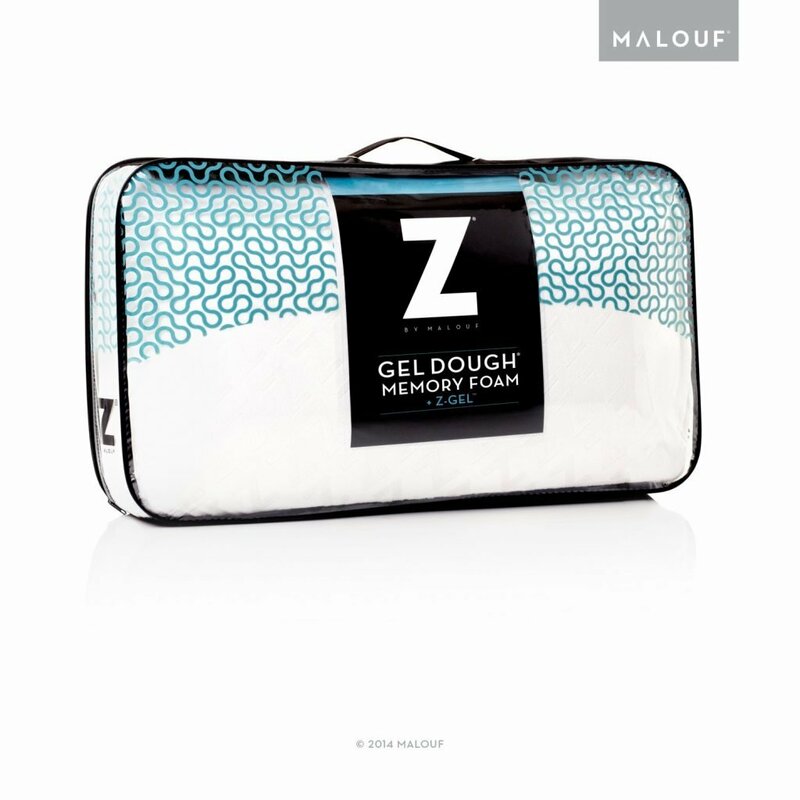 Gel-infused foam with ventilation holes, as found in the MALOUF Z Gel Dough Memory Foam Pillow are single slabs of material offering lots of bounce, softness and cooling ventilation. Cooling gel inserts, such as found in the Save&Soft Memory Foam Pillow offer optimum coolness on hot summer nights. 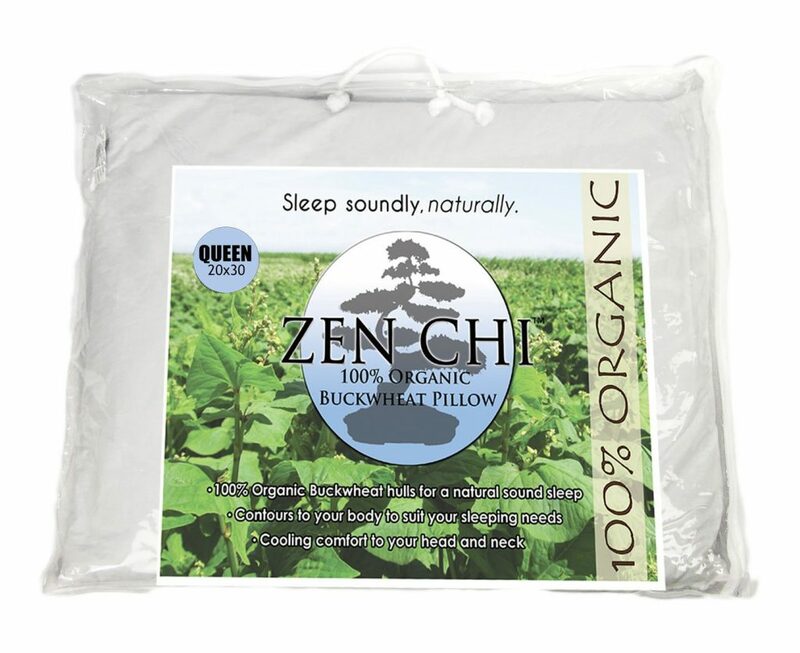 Buckwheat hulls are used as filling in organic, green chilling pillows, as is the case with our top-rated Zen Chi Organic Buckwheat Pillow, but not ideal for those who want a fluffier pillow that is not that heavy. 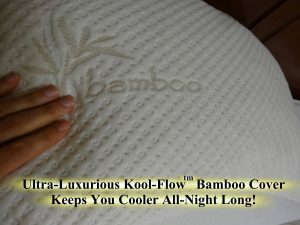 Perhaps the most desirable feature in a cover for a cooling pillow is its ability to wick moisture and heat away from the face naturally and that is found in covers made of natural bamboo fibers. Pillow covers are also available with Aloe Vera, lavender, and other infusions which add to the pillow’s hypoallergenic features. Durability is also a factor, with Tencel, Polyester, and Lycra being desirable fabrics for a slipcover. When shopping for a chillow, you should also look for slipcovers that can be cleaned easily in the washer and dryer. The best quality cooling pillows also come with a YKK zipper that lasts a long time, as is the case with our top-rated Simply Slumber Memory Foam Body Pillow. 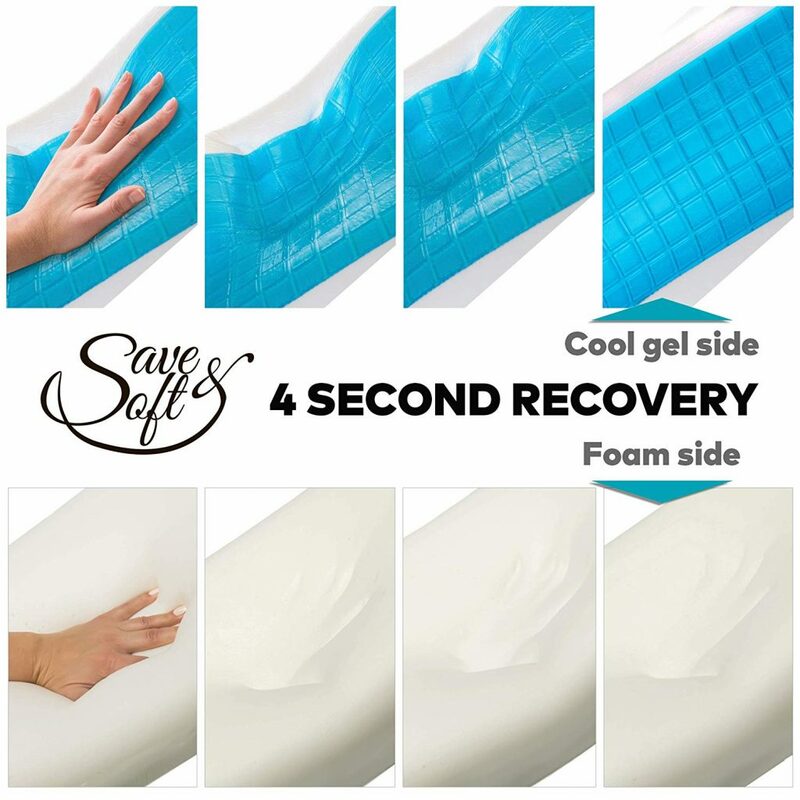 The firmness of the cooling pillow that is best for you is going to depend a great deal on the style or brand and whether or not it has a factor called “loft”. 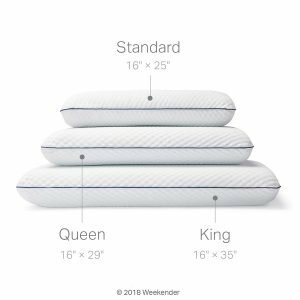 The higher the “loft” of the pillow, the softer it is going to be, as would be the case with the WEEKENDER Ventilated Gel Memory Foam Pillow, which has a height of five inches. 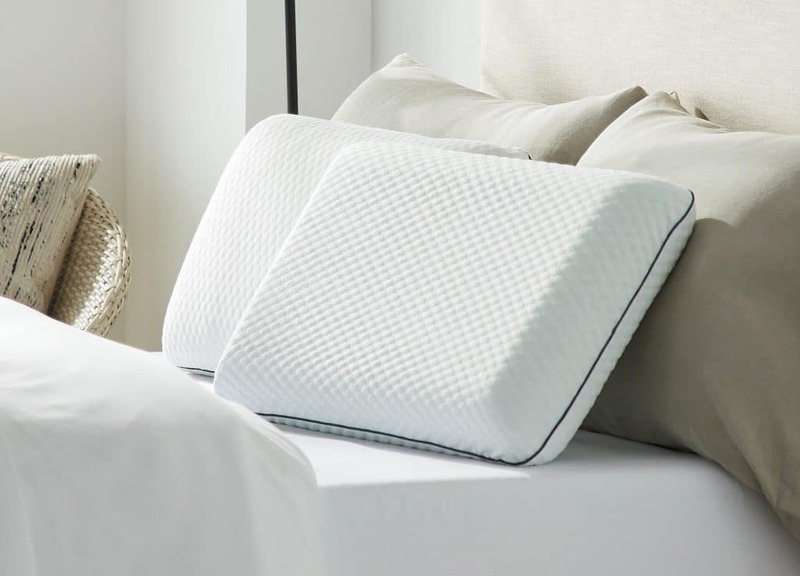 Cooling pillows filled with memory foam chips tend to be more supportive and firm than ones that consist of slabs of memory foam or natural buckwheat hulls. The firmest pillows tend to be the flatter ones that have a chiropractic component along with a cooling gel insert such as the Save&Soft Gel Memory Foam Pillow. Not all cooling pillows are available in a variety of sizes or even the standard sizes that you might be used to, such as Standard, Queen, and King. 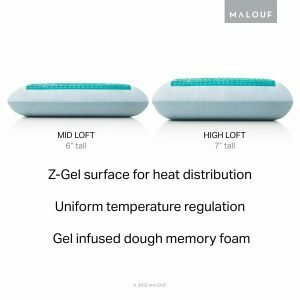 The MALOUF Z Gel Dough Memory Foam Pillow is an exception, as it not only comes in those sizes but also different firmness and loft levels. Cooling pillows do not always come with certifications, but here are some labels you might want to look for when shopping for a pillow. Perhaps one of the most important is the CertiPUR-US certification, which means the pillow is tested for purity in the USA and made without ozone depleters, flame retardants, mercury, lead and formaldehyde as this means it contains less than 0.5 parts per million volatile organic compounds. You might also want to look for a label that says that a USA Certified Bed Manufacturer made it. This means that the pillow was made in the USA and not in a foreign country that does not have such strict safety regulations. When buying a cooling pillow it is a good idea to purchase one that has some kind of immediate return policy, especially if it is a chiropractic pillow. 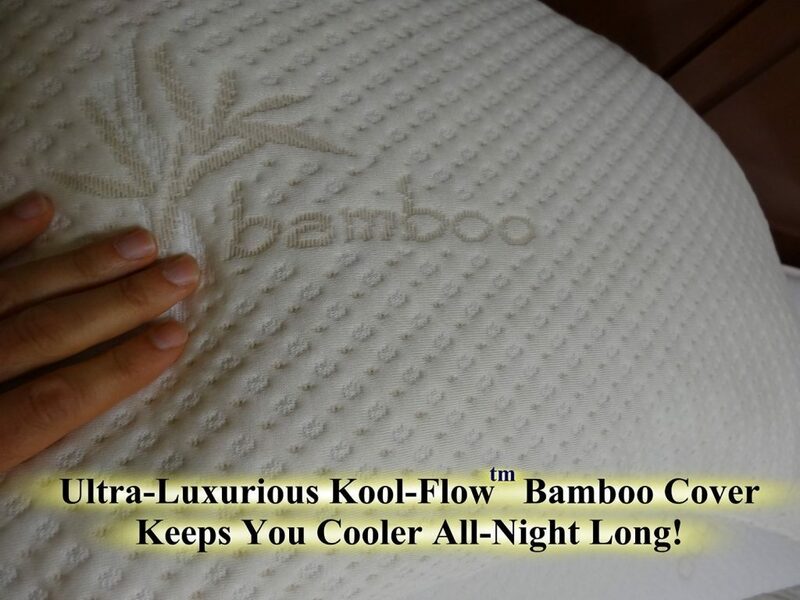 For instance, a good deal is our top-rated Snuggle-Pedic Ultra-Luxury Bamboo cooling pillow, which gives you two months to take it back if you are unhappy with it, and it also offers the consumer a spectacular 20-year warranty. However, for the most part, cooling pillow manufacturers offer a guarantee that is between two and three years long and a 30-day return policy, especially if you want to buy a cooling pillow that is affordable. Slipcovers can be infused with aloe vera to improve the texture and cool feel of the pillow. Gel-infused memory foam pillows can be infused with herbal essences that help you sleep such as lavender or chamomile. Some memory foam pillows are infused with charcoal to offset any odors from off-gassing. A ventilated mesh trim on the seam of the pillow, as is part of the Perfect Cloud Double Airflow Memory Foam Pillow, can help air circulate through it and keep you cool. 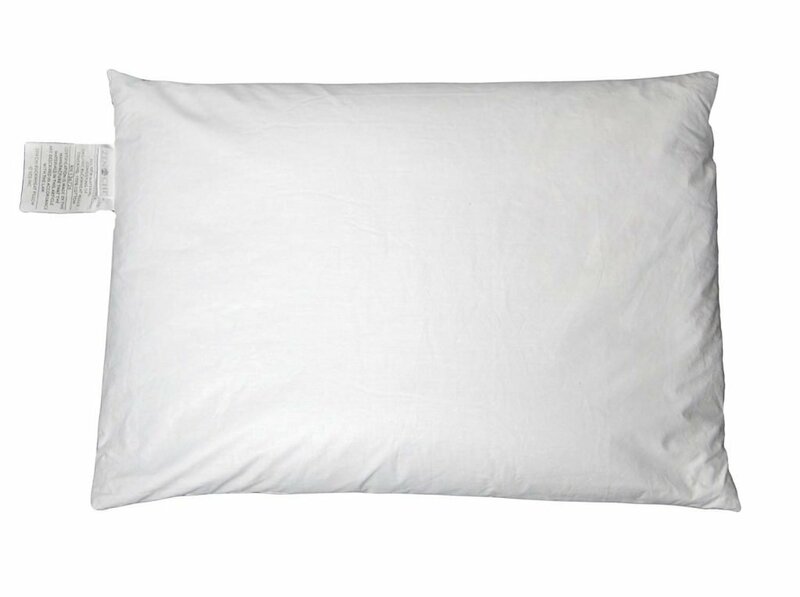 Look for a pillow with less than .05 VOC to prevent off gassing and odors when it is unpacked. Look for a pillow with a high-quality zipper, as a broken zipper can undermine the number of years you will be able to use it. You might also consider buying a full-length body pillow, such as our highly-rated Simply Slumber Memory Foam Body Pillow, especially if you are nursing, lonely or have back pain. Aside from buying a cooling pillow there are other measures that you can take to help you literally chill out peacefully all night. Crank up the air conditioning. Studies have shown that people sleep better in a cooler If you don’t have an air conditioner, you can place a fan in front of a metal pan filled with ice and position it so that it is blowing cool air over your body. Choose cotton or bamboo sheets. Sheets made of bamboo or cotton tend to let your skin breathe on hot humid nights. Bamboo, in particular, is a cooling fiber that helps to wick moisture away from the skin. Chill your sheets in the freezer before making your bed for the night. Simply fold up your sheets, put them in a plastic bag, and let them sit in your freezer for at least half an hour, before making up your bed for the night. Wear lose pajamas or none at all. The fewer clothes you have on while you are resting, the cooler your skin will feel. Light cotton nighties and pajamas can help you stay cool. Spritz your face with water. Use an atomizer filled with water to spritz your face with ice cool water whenever you feel a case of the night sweats coming on. Take a cool shower before you go to bed. Make sure you are nice and dry before you get beneath the covers. Turn off the lights. The darker your room is, the cooler it is going to be. In the summertime, keep your curtains closed in your bedroom to prevent sun shining in the window from warming your sleeping area up. Which model is the best for reducing night sweats? Almost all of the cooling pillows here are great for handling night sweats but our top choice for this purpose is the MALOUF Z Gel Dough Memory Foam Pillow thanks to its gel-infused memory foam and cooling liquid gel inside. How often should I wash the pillow cover/pillow itself? 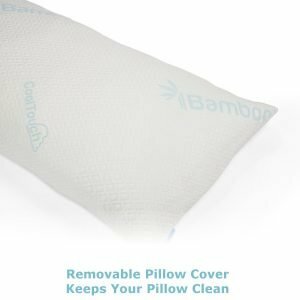 Whether made of bamboo, polyester or velour, most cooling pillowcases are durable enough to wash every day if need be, but that probably won’t be necessary unless you sweat heavily every night. How long a memory foam pillow will last? 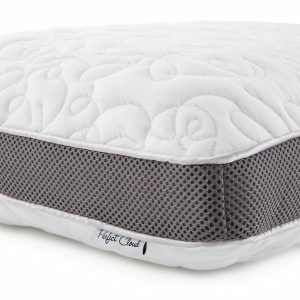 A high-quality memory foam pillow can last for ten or even twenty years; however, some individuals have reported the memory foam in some models is going flat in three months. Like anything you purchase, how long it lasts might depend on how much you paid for it, how many times you wash it a week and how well you treat it in general. 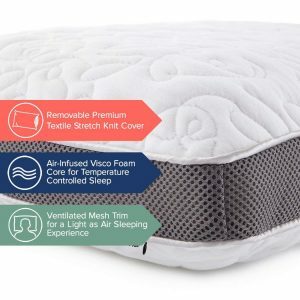 In the end, we found ourselves giving an all-natural cooling pillow the same top rating as a gel dough memory foam pillow to offer you the best of both worlds. 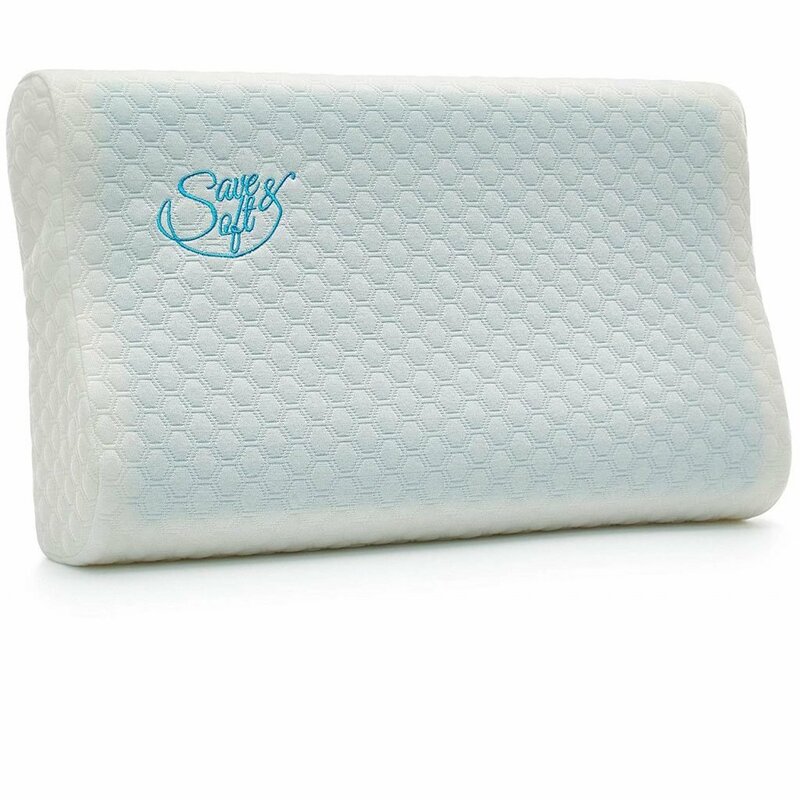 Or top pick, the Save&Soft Gel Memory Foam Pillow is an orthopedic model, meaning it helps to align your neck and spine whether you’re a side, back, or stomach sleeper. Also, it’s made from memory foam with cooling gel pads so it will easily keep you cool throughout the entire night. 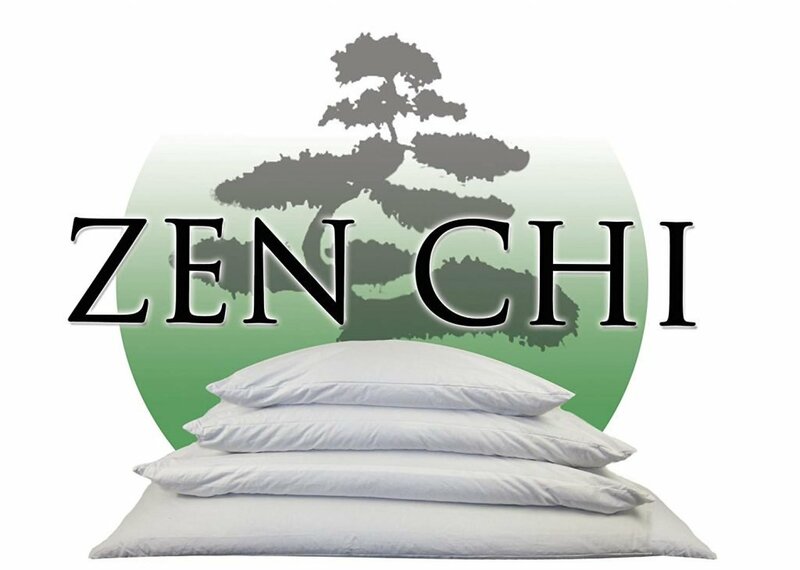 The Zen Chi Organic Buckwheat Pillow is an excellent choice for individuals who want a green product that offers lots of cervical support and air circulation. 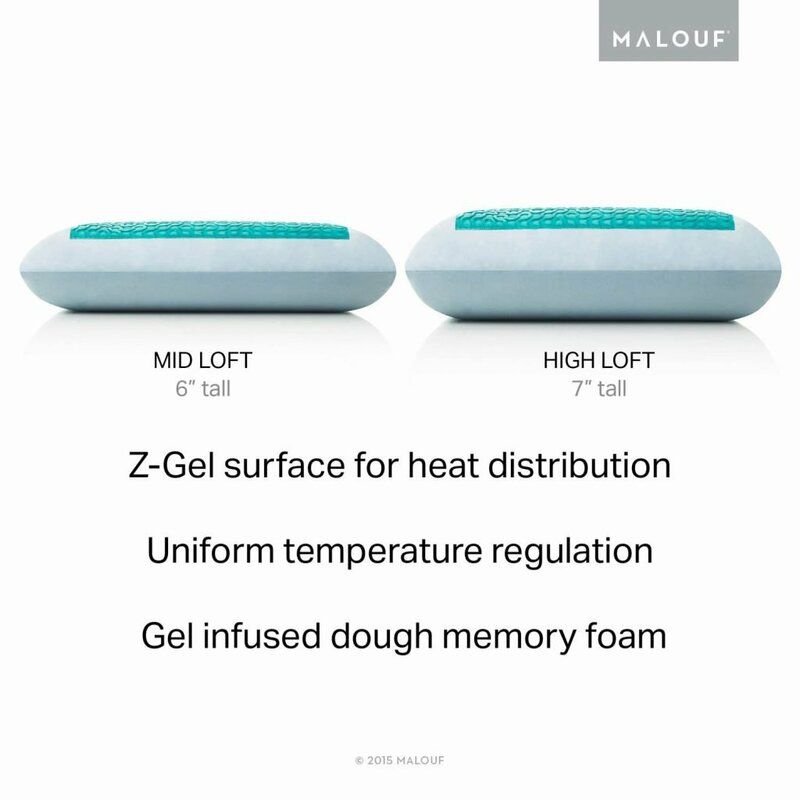 At the other end of the spectrum is the much more technically advanced MALOUF Z Gel Dough Memory Foam pillow, which contains gel-infused foam topped with a cooling gel pack and is offered in three loft heights and two firmness levels.